For some people half the battle of voting is getting to the polls, but this year voters can get some relief from a slightly unexpected source: Uber and Lyft. 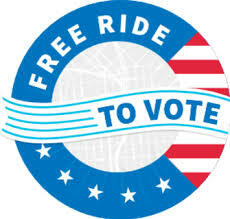 Both ride share companies are offering free or discounted rides to voters on Nov. 6, and both companies are partnering with voting organizations that encourage people to register and then go out to vote. According to Pew Research, 3 percent of registered voters who did not vote in 2016 cited “transportation problems” as the main reason they didn’t vote. Additionally, 14 percent of people cited that they were “too busy or conflicting schedule,” and “inconvenient hours or polling places,” which are issues that tend to affect low income communities. This is why Lyft in particular said it wants to offer free rides to underserved communities. Uber said in a press release it is partnering with When We All Vote to get people registered and with #VoteTogether and Democracy Works to offer free rides to polling places. Uber is also sharing voter registration resources with users in the app. In order to get a free ride to the polls on Elections Day, users will need to open the app, search for their polling place using the “get to the polls” button, and order a ride. It appears that users will not be able to use the free ride for another location as the polling place search bar is separate from the standard location search bar. Lyft announced its Election Day initiatives back in August, partnering with Vote.org, Turbo Vote, Nonprofit Vote, and other organizations which will distribute promo codes for 50 percent off rides to polling places. Lyft has also partnered with Vote Latino, the National Federation of the Blind, and Urban League affiliates to provide free rides to underserved communities. Like Uber, Lyft is also encouraging its users to register to vote through the app, and partnered with When We All Vote and National Voter Registration Day to amplify their get out the vote efforts. More information about how to get a free or discounted ride to your polling location can be found on Uber and Lyft’s websites. In New Jersey, the deadline to register to vote was Oct. 16.